Gmail app for iOS devices has been updated to version 2.0 which brings many of the much-sought feature and thus, makes gmail app on par with android counterpart. The new interface of gmail app has become more useful with its simple and clean design. 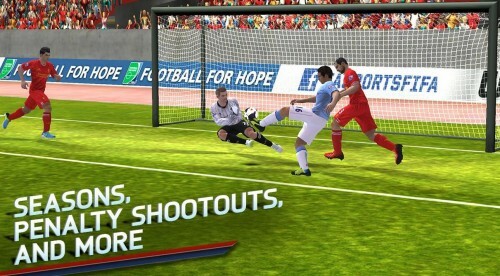 The app has become more responsive and smooth in operation. Multiple gmail accounts support has also been added so that users with more than 1 gmail account could configure gmail app on their iPhones to sync multiple accounts (upto 5 accounts supported, but the inboxes are not unified at single place i.e. inbox of every account resides under its own folder/label). Other features that are added include auto-complete which allows you to operate this app quicker and easier, integration with Google Calendar and Google Plus so that user could directly +1 any Google Plus posts or comment on the same. Also added is the lockscreen notification on iOS devices. This update does bring a lot of needed improvements. 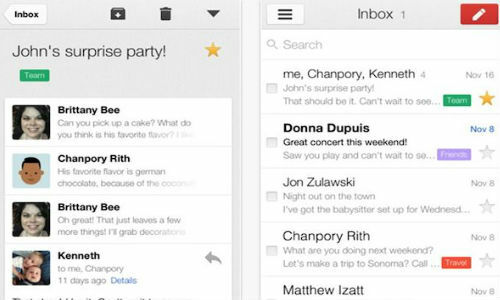 Another popular ios client for gmail was Sparrow app, but now that Sparrow has been acquired by Google, one can expect a lot more features and updates in coming months. Download new gmail 2.0 from iTunes store on your iOS device as it is available for free. 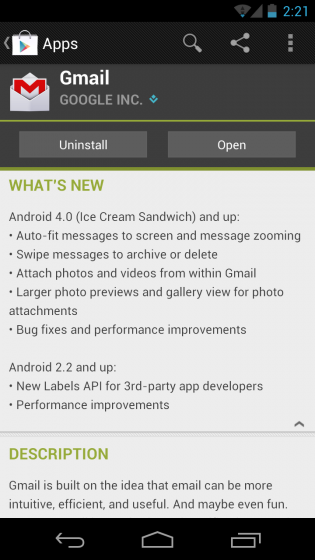 Gmail app for Google’s android 4.0 + devices (IceCream Sandwich and Jelly Bean OS) has also been updated to 4.2.1 which brings new features aside from performance improvements and bugs fixes. 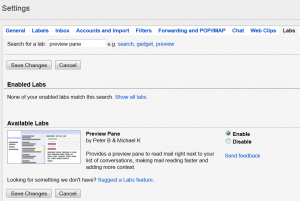 Now you can swipe any conversation from the emails list to archive or delete it. In this new updated gmail app for android 4 and up, you can even attach files (images and videos) directly from within app. Images previews are now larger than before. You can even pinch to zoom email contents and set messages to auto-fit screen. Visit Google Play Store on your phone to update gmail app manually if you’ve not set it to auto-update. If you’re not getting these new features to show up, follow our guide below. Hit on phone menu/option button and select settings. Tick mark Auto-fit messages option if you want to use pinch-to-zoom messages feature. You can change the default swiping behavior also or even disable it. Tap Swiping Conversation list. Choose Has no effect if you want to disable swiping action. Choose Always deletes if you don’t care about archiving email messages. By default, Archives or deletes is selected – This means that when you swipe a conversation from the list in inbox, it archives the email. When you swipe a conversation from Sent folder, it deletes it. So, based on your currently active position in gmail, it decides whether to archive it or delete it. Swiping right or left initiates the same action in this gmail app version. There are other options also. Feel free to try them, like hide checkboxes so that you could just hold any conversation from the messages list to select it, etc. Users are also getting notification in their gmail account in browsers on pc regarding the newly released gmail app update. Well, are Windows Phone users left out? What about gmail app for windows phone devices? Well, some of you might say, who cares about windows phone users! Well, the update is just for Android 4+ devices because of the limitations of older android versions.. It is not intentional rather forced decision. Certain programming hooks/calls might not be present in earlier version of android to support the latest gmail app features, and hence so..